February 20, 2003 Origami Designs Folds for Warner Bros. Tune in to NBC Drama Emergency at 10pm PST (or check your local listings) Third is a series of new episodes, the origami crane premiers in the episode titled "1000 cranes". In this episode the teenage cancer patient struggles with his cancer. Origami Designs provided the beautiful cranes (for hope and peace) used in the filming on location in Chicago. Origami Designs models, materials, and education items are featured and presented for the public viewing in the two large display cases of the North Entrance of the main Library in Pasadena, California. This exhibit is a special opportunity for Origami Designs to share with as many as 3000 visitors a day, the beauty, the joy, and educational benefits of folding Origami. Included were models for children, Kusudama, Senbazuru, modular units, advanced folding, origami for decorating, advertising, jewelry, gifts and more. 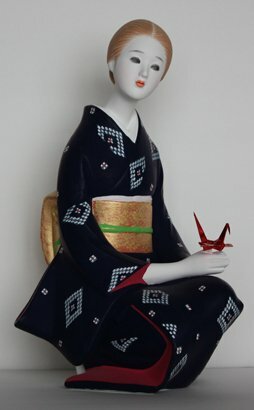 The display featured a special section on Sadako and the Story of the 1000 Cranes. (With video and CD) Please check back here to the events page for a possible display designed for Children for this Library in Pasadena. Showcasing the wonders of Origami in Foil. Origami Designs decorates a tree for display at Local Florist - The Flowerman (call for details and hours) - featuring nearly 200 pieces of origami folded in stunning gold foils. This tree was decorated with tradition cranes, ceremonial cranes, peacocks, fans & holiday origami models. 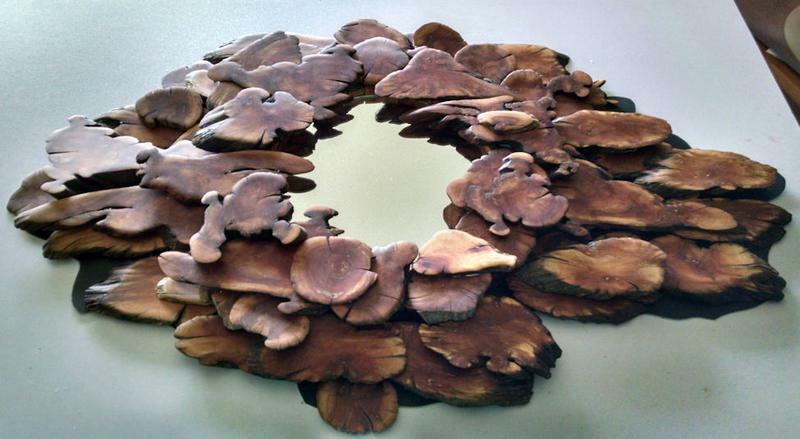 Complemented with floral sprigs, flowers and natural pinecones from the giant redwood trees of California the tree is on display during the month of December 2002. Crane ornaments were available for those wishing to take a piece of origami "peace" home for holiday decorating or trees. .
Yoshino Japanese Antigues Pasadena, CA. Invites Origami Designs to design and decorate special origami ornaments for a tree on display during this month of December 2003 (please see during store hours - or visible from the street after hours). Origami Designs decorated the tree with tradition origami cranes, ceremonial cranes, peacocks, and other items traditionally used on trees in Japan by those celebrating Christmas. Beautiful origami lanterns and fans, along with other special items, folded in a variety of custom foils in multi colors covered the Display Tree sitting in the center of the newly decorated authentic Japanese Tea Room. 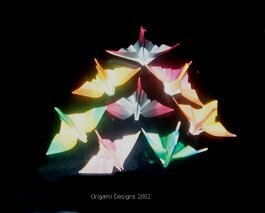 12/12/02 "Hindsight"..... Origami Designs does a special little tree for an episode of NBC's TV drama Emergency. This was to be a Christmas Gift to the set.... and like any little tree, resembling one worthy of "Charlie Brown"... Origami Designs was thrilled they wanted to use it. It was indeed a calamity of errors, rush on-location- filming, etc. that came with this little tree and it's creation. Photos of this tree are available here! Calendar of Events past, present and in the future for Origami Designs - Events Overview - Archive. 10/17/02 "Walk Like A Man" Origami Designs folds for this episode of the prime time drama Emergency on NBC. An unusual request came for Origami for this episode with Jerry exploring his talent with folding! 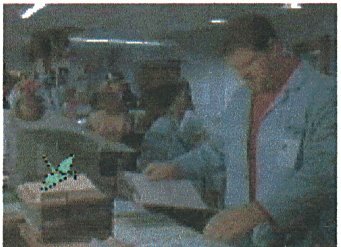 Folded from medical paper used on the set of this long running drama.... it was a thrill for Origami Designs a long time fan of ER! Origami Designs premiers new items for the Thanksgiving holiday season. 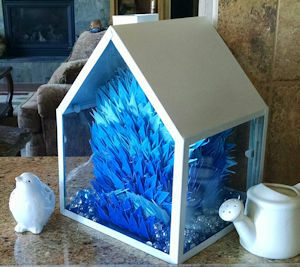 For home decorating, table centerpieces, adding origami to floral arrangements and more click here. 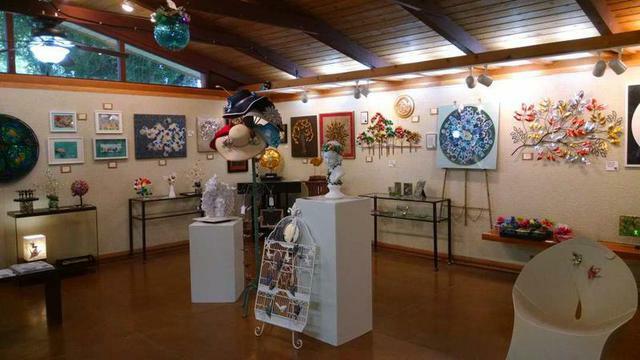 Origami Designs expands the Gallery and availibility of items for order online. New books and custom ideas are added to the website as Origami Designs launches business online and nationally. Origami goes to the classroom. Sharing the joy of the art is the most rewarding thing I do. Origami Designs goes to the Frostig Center in Pasadena, to give an introductory class to about 20 middle & high school art class students. The students were great! Origami bases, models, books, & folding instructions were covered in this visit. It was a wonderful interactive hour for students & faculty alike. The enthusiasm of the students is rewarding & appreciated. It all starts with that single square of paper. Origami Designs undates the "Books" webpage here in May! Announces that our special Single Hanging Crane is now available and offered at The STORE at CENTRAL. Located in the Center Branch, the main branch, of the Pasadena Ca. 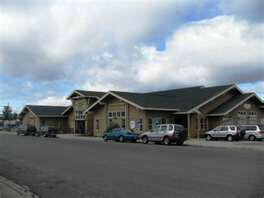 library is a special store offering a fine selection of books and other gift items. 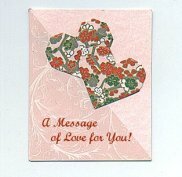 Origami Designs is pleased to have the Single Crane offered at the store. Our single crane on base is also available. If the store is out of these items, please contact us by email for purchase. Summer brings Origami Designs to children in special events. Origami workshops for the Childrens Series were offered by registration. 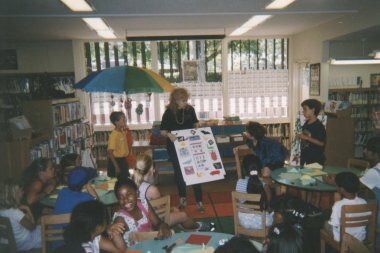 Local Origami Artist, Ms. Turner, presented 10 - 1 hour workshops during the third week of July 2003, for the City Of Pasadena. . "Get Wild with Origami" taking children on an Origami Safari, teaching beginning folding techniques, in a fun and entertainng hour. All children received their own packet and certificate from the workshops! Origami Designs provides a variety of colorful & interesting ORIGAMI for the large front window display at the Vroman's Hasting's Ranch. The fabulous display of origami books available. is enhanced by the addition of the visual display of origami, large & small, by local origami artist, Ms. Turner. The books and origami will be on display for two months. "I am truly impressed by the selection of books chosen for sale by Vroman's & encourage all to view the display & pick up a book or two!! Click our Globe at right for DETAILS!!! The Festival showing is now over. There are plans to reopen the exhibit locally in So California again in 2005 Check here for information. Late received models were added to the displays. Names were added to the Leaves pages! PHOTO pages are now online - click to see the wonderful origami displayed from folders in the USA & around the world! Rarely do we get to see and experience this kind of folding locally! We want to thank all those who attended and those who contributed! New Origami Display at Pasadena Ca. Main Library On display in the main room cases near the Children's Wing - Origami Designs has two cases. Specifically designed to inspire enthusiasm in children, & encourage parents to introduce origami to kids, & inform the public about origami! These displays include origami animals "In the forest...", "prehistoric origami", and "jungle origami" to coincide with the "Get Wild with Origami" workshops by Origami Designs in July. The second case presents 3-D origami, Modular & Math origami, the simple & the complex, & a special display about mythological/fantasy origami, including dragons and an origami castle! 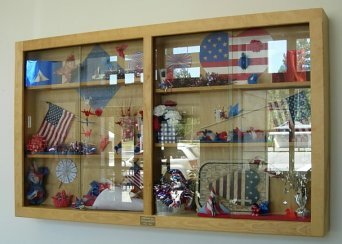 These display are available for viewing during the month of August at the Library. This December again, Origami Designs made cranes & holiday decorations for several Christmas Trees. New Christmas flowers in gold and silver speciality papers were added to the offering of "Holiday Items Available". "Ride A Wild Tale" Origami Designs offers fun & wild origami workshops for kids 9 - 13 yrs* as part of the Pasadena Library Summer Program, June & July 2004! Details on workshops as finalized! WINGS N' THINGS! July & August of 2004 At the Pasadena Main Library for Teens! Workshops with fantastic wings N things origami. 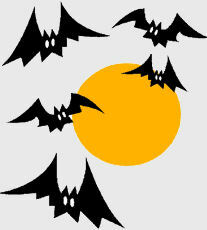 Bat, butterflies, flying dragons, airplanes, fighter jets, Star Wars, dragonflies, bugs, and more! Challenging & impressive origami odels at these workshops! Check out the website at the library! 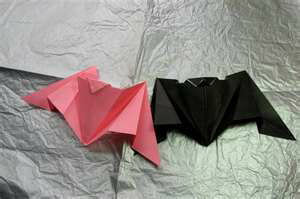 Special WORKSHOPs featured by: SET THE MOOD & Origami Designs adult & kids, beginners & all folders. 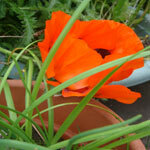 Workshops In Sept & Dec were great fun for all who attended! 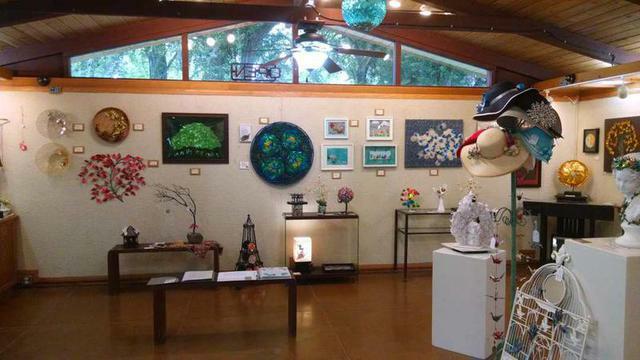 A display of Christmas origami art is still on display at the location in Montrose, with selected items available for purchase! 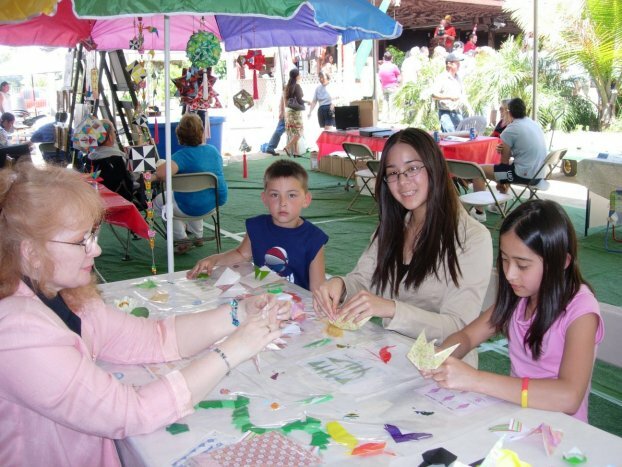 * Origami Designs: March 2005 Santa Catalina Branch Pasadena Public Library offers Spring workshop for young people 3pm Mar 22! Thank you to the library for having us there!! 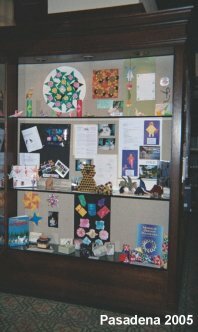 * Origami Designs: January 2005 Display includes origami models from around the world! This extensive display occupies many cases through out the MAIN Branch & available for viewing the entire month of January. tree at the library and for the holidays! 3 - 4:30pm Thank you all for coming! It was wonderful!! .....folding, chatting, & instructing visitors with fun origami models. See their website & flyer about for details & directions. Origami demos for adults & children of all ages!! 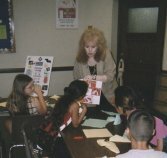 City of Pasadena Library workshops for the children!! 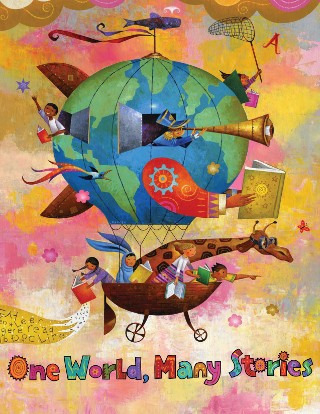 City of Arcadia, Library workshops for the children!! 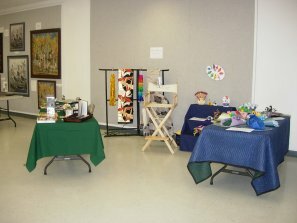 for children and adults - all ages specific workshops! 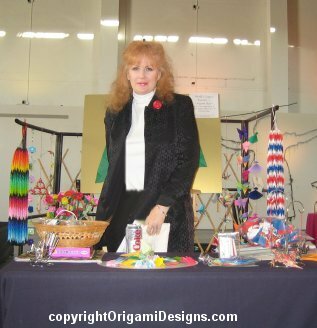 May 21, 2005 Origami Designs joins other vendors & artists, in Displays, Exhibitions, & Demonstrations at the "Japanese Cultural Festival". Hosted at Pasadena City College, Pasadena, California, at Harbeson Hall and outside in the "Quad" on the lovely campus, Barbara shared her love of origami with visitors. Participation in such events is always enjoyable!! Thank you PCC for inviting & including Origami Designs. Super Reading, Super Heros, Super Origami. Our first four offerings were full and wonderful fun for kids and parents alike! A Special ThankYou to the City Of Arcadia, & library staff from Origami Designs. Look for us there in Nov. or Dec! 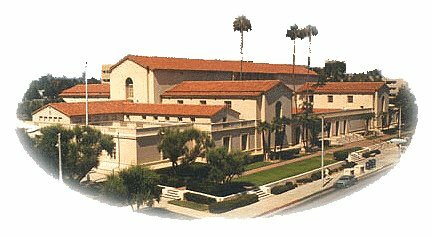 Our third Year at Pasadena's Library Branches! 3 Dates In July 2 More In August! We were full again with great kids, parents, & origami fun! Thank You City of Pasadena!! Monrovia Community Center Summer Workshops! July was great ! 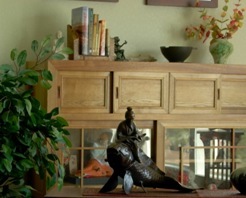 Origami Designs visits the Sunrise Senior Living Residence In San Marino, California. When time permits and I can donate time, I really enjoy these visits and workshops. The enthusiasm and participation is inspiring to me as an origami artist. The benefits of origami both socially and mentally are evident in all ages of folders, and so it's a great experience and activity for me and folders alike. Thank You Sunrise!! Origami Designs Artist "live" In Pasadena, in September 2005 - 25th Click on either ad, right or left for details & photos of this event!! page at Origami Designs for US & International Origami Events! Origami Designs sends 200 Whales in May 2007 for the curtain of whales. The call came from the Women's Council with only days before the annual event. Origami Designs was delighted to do some creative architectual , CENTERPIECES - for 20 tables at the event. This is the MOST rewarding folding, - the kind that hopefully will inspire attendees to investigate origam! We hope students are full of curiosity about Origamic Architecture too! Always important is going to the schools. We started at Shasta & will visit about 6 schools in 2009! ER TV show origami 2008!!. Always folding for Corporate Jobs! I am always involved with custom works, mosaics, origami art projects & local work in my new home community. engagements on my yearly calendar. I devote some time and enjoy doing things out in the community. SEE BELOW! Klamath Falls. 2 - 3:30 Folding Halloween Origami! 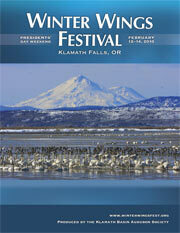 Winter Wings Festival held at OIT in Klamath Falls, February! Next Year, Origami Designs will have our own display! the local Northside Klamath Garden Club Meeting at the Glad Tidings Church! Flowers will be displayed and folded! EARTHDAY Origami Designs generated a lot of energy & some interest in Origami! Thanks you to all who came see the displays, ask questions, those who visited & stayed to fold! Conserve to Preserve! Origami and math, - origami and earthday. Origami Designs is excited to become involved with the important issues being explored at the Oregon Institute of Technology. Visitors we invited to fold models for the castle, tetrahedrons, dragons and more. 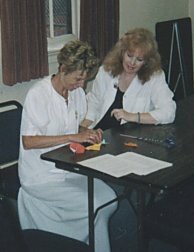 Emphasis was on education, & the practical uses in sience, math, and every day medicine and techology involved the study and use of origami and folding techniques! 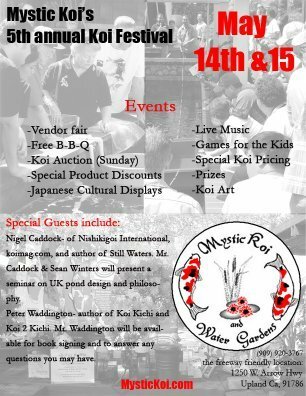 & organizing origami events for local and visitors, in this inspiring community! For the 3rd & 4th grade is was a good time!Handouts included pelican models, a penquin, & fortune teller. The class folded the helmet base Kabuto Helmet, a great fox model, the fortune teller and... the pieces for great unity dragons & other models! June was great for origami education! Corinne presents me with her Swan Model! Click the swam pic for more photos of her swam!! July to see more when added! 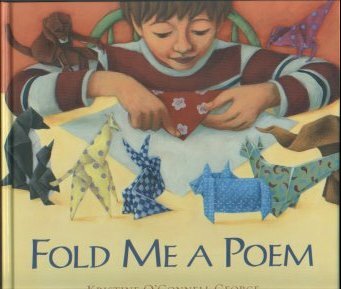 Fold Me A Poem is featured. Enjoy the reading, Watch the origami artist fold models from the story. Children in attendance will recieve models of their own! fun event for the kids & parents. TRVA Second Annual 'Meet the Artists' Ever visit a gallery and wonder how an artist creates his work or have questions you'd love to ask if only you could talk to the creator of that wonderful piece of art? Saturday August 28th, 2010 when Two Rivers Gallery presenteds artists & their artwork at the Second Annual 'Meet the Artists' fundraiser. 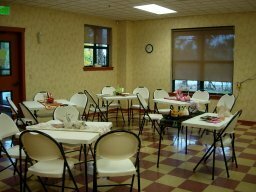 The event was be held in the Chiloquin Community Center 140 So. 1st St., from 1 pm 'til 4 pm. 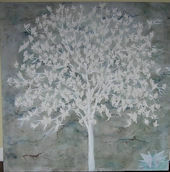 Featured among 4 other artist was Origami artist (Barbara Turner) . Thank you to all who visited and stopped to chat about origami at the the Origami Area and Display. It is always nice to chat and share the benefits and joys of this beautiful artform. 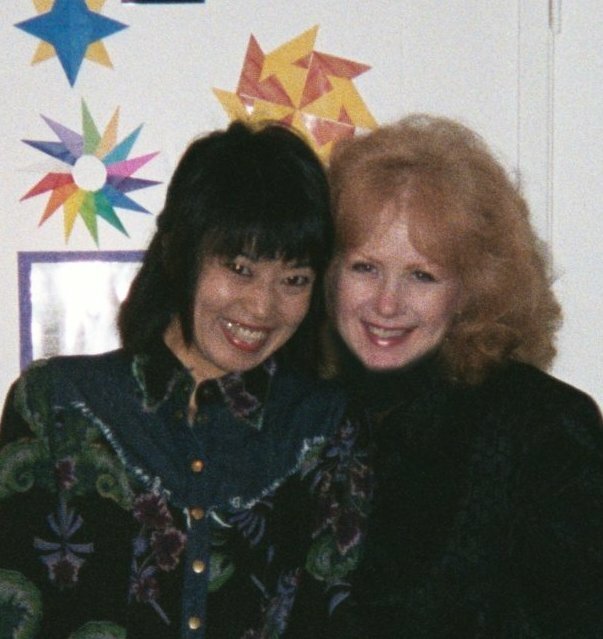 Artist & Visiting Japanese Guest Hitomi! Volunteer work is always important in our community ! March 2011 Origami Design joined other instructors at the Kaleidoscope of Learning in Klamath hosting and origami workshops! May of 2011 Origami Designs visits SAGE school, bringing origami on Fabulous Friday to some fabulous kids! Origami Artist - Barbara Turner - continues her 10th Year with the Library Summer Reading Program Everyone enjoys the afternoon and went home withh origami! Holiday Origami Workshop Presented for Adults! 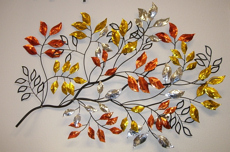 Ornaments, decorations for trees, centerpieces, entertaining, cards & more! Materials: Folding paper provided. Model instructions provided. 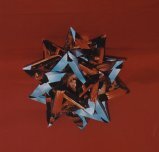 An Origami Artist shares her work, information, explanations, details, and stories of her work as an origami artist. Speaking to the local Chapter Group of women who are members of this philanthropic organization. From the PEO: "Hi Barbara: Your presentation/presence at our PEO (Philanthropic Educational Organization) meeting yesterday was a huge hit for the 30 ladies who were present. Besides being extremely informative, you were entertaining to the hilt! I heard comments like "I didn't know anything about that, "Well, that was a really fun program", and "It was neat meeting Barbara, she's a kick!" Thank you so much for enlightening us on your art. We'll look forward to a fun field trip to your studio May ... ,,,, Again, thanks for being here. All of us enjoyed your "gig" tremendously and had a great time! " of Origami - the art of folding paper. "Spark a Reaction" The overall theme for 2014 is SCIENCE. May - Two New original origami Wall artwork!! 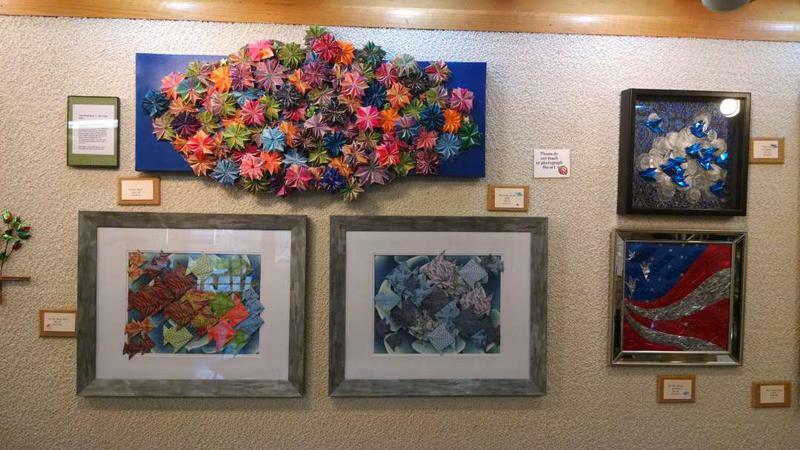 Origami Designs Artwork at The Ross Ragland and Klamath Falls Airport !